Hi foodies..Welcome to AYESHA’S KITCHEN. Banana fritters are very popular evening snack in Kerala. 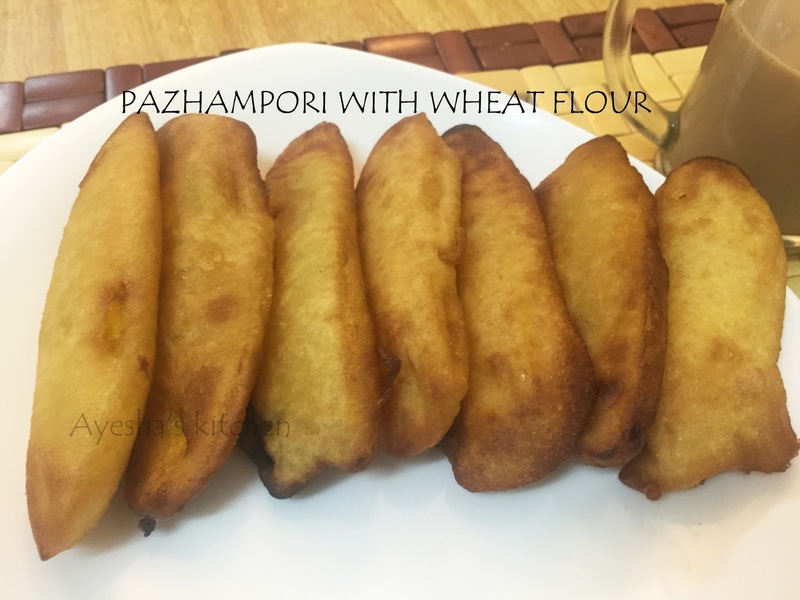 It is mainly prepared with plantain (ethakka ) and so it is called as ethakkappam in kerala or pazham pori. A vegetarian sweet snack that holds a special place in kerala cuisine. The flour which is used for the batter is all purpose flour / maida but i usually use wheat flour without egg and without baking powder. But still the same taste and texture. Then why should we use the maida, which is unhealthy???. Here is the recipe. Kindly please follow the exact measurement and recipe .Enjoy cooking!! Cut the plantain into slices and set aside. Transfer it to a bowl. Add cardamom powder and salt to it. Mix well. Now heat a heavy bottommed wok, when hot add oil for deep fryig. When the oil becomes hot makes the flame to medium. Do not fry the bananas in high flame or low flame. Take a banana slice and dip in the flour batter. The plantain should be covered fully with the flour batter. This will be possible only when the batter is of minimum thick consistency. Now drop it into the hot oil. Continue with all other slices. You can make 3 or 4 fritter at a time. When done drain the excess oil and set aside. Serve hot with a nice cup of tea.